Rail booking groups Trainline.com and Qjump are to merge, creating a new firm responsible for issuing 10% of all rail tickets. Up to 190 jobs are expected to go at Qjump with the closure of its Sheffield call centre in an attempt to cut costs. Call-centre provider Sitel UK has been given the contract to manage calls at its site in Newcastle. The company, to be called TheTrainline, will be the UK's largest rail retailer with annual sales of about £300m. 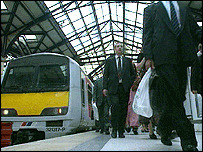 The move will not affect existing Trainline employees, who will continue to work from their two centres in Scotland. Trainline currently employs around 1,000 staff at the centres. The combined business - handling around eight million customers a year - will provide services to the companies owned by the National Express Group, including Midland Mainline, Greater Anglia, ScotRail and Central Trains. It will continue to have headquarters in London. The new business will be 86% owned by Virgin, which has increased its holding through the purchase of a 49% shareholding from Stagecoach for £4m.